I inspected the medal today. The obverse was originally blank. 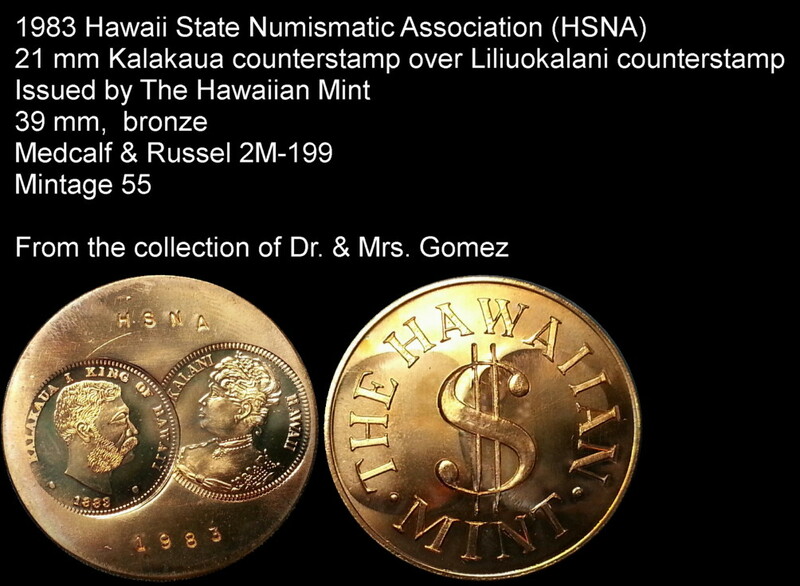 The Queen Liliuokalani counterstamp was first struck. Then the Kalakaua counterstamp was made. The letters and numbers were then struck. M&R incorrectly states “…dies struck as a pair.” The overlapping of the counterstamps clearly shows that the two dies can only overlap. In addition, the Kalakaua counterstamp is over the Liliuokalani counterstamp. Also, the listed catalog price seem too low. I can surmise that the coins given away in 1983 were mishandled as a curiosity piece (touched, inspected, and passed around). Not many retained its original mint state condition. It is also, highly unlikely others were made and sold. From my reference documents, 2MB-199 may be the only medals to use 21 mm counterstamps. It is also the only medal to have two obverse counterstamps from different dies.